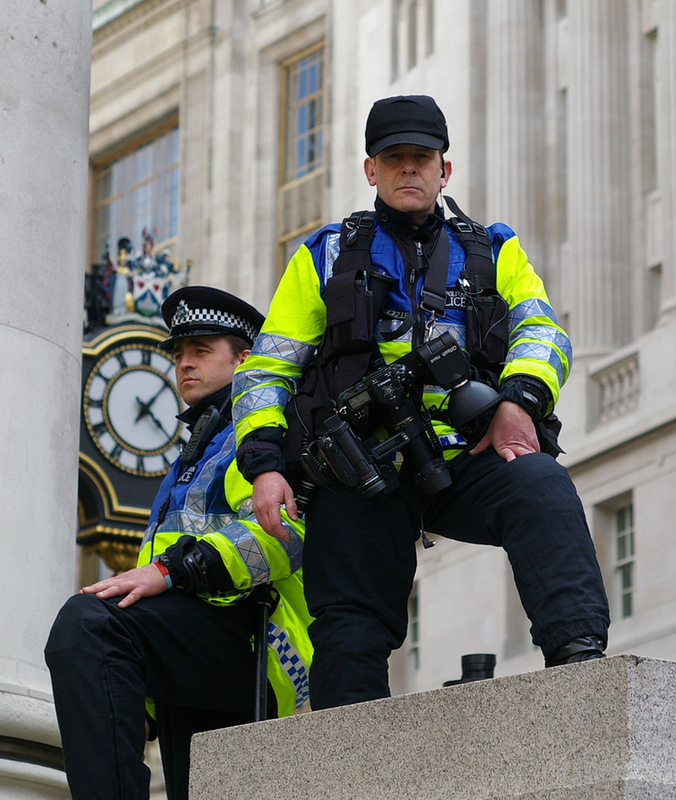 I took the above photo at a G20 protest in London in 2009, of the forward intelligence team . I was using a Pentax K110D and Pentax--M 50mm 1.7 lens. I haven't discussed my politics at all in this blog, and I feel as though I'm avoiding the issue. Actually, to be honest, I have. Openly discussing politics can be both confrontational, and in polite society, rude. People that talk politics can be seen as overtly opinionated. And yet, to have no political stance, nor views, could be seen as ignorant. Many years ago, I was a licensed shortwave radio ham. My licence actually specified that I was not allowed to discuss neither religion, nor politics. Conversations were all too frequently technical, and boring, but other than competition for frequency space, you'd rarely hear any confrontation between operators. However, I created this blog, not for popularity, but as a journal to record whatever goes through my head, be it interests in film photography, nutrition, prehistory, or even political events. So here goes. All too often, a political stance is measured along one axis, from extreme left (either Anarchism or Communism), through to extreme right (Fascism). All of those mainstream politicians here in the so-called Western liberal democracies or representative democracies, jostle for what they call the middle ground. In most such nation-states, two or three mainstream political parties take it in turns to take power. Their political ideology is regarded to be to the left, or to the right, of the other. A radical critic (that's me), might suggest that in truth, both parties are conservative, and interested in maintaining the status quo. Both work with Capital, and avoid upsetting the Markets too much with their policies. The one on the Left makes Capitalism more acceptable, by redistributing some wealth in the form of tax to welfare. When taxes increase too much, the party on the Right comes to power, and cuts the welfare back, making it all more efficient. When they've perhaps gone a little too far, the party of the Left returns to power, and so on it goes. In the Sailing World, this process would be called beating - a ship zig zags to work the wind, but maintains it's underlying course. Neither political party ever actually changes the underlying course of society. Between them, they preserve the status quo. They remind me a little bit of the Red and Blue teams of athletes that once competed across the old Roman Empire, keeping the masses happy and entertained. Some things don't really change, perhaps that is why I love history. But I'm already wandering away from the subject. Many analysts have, for many years, realised that there isn't really a lot of meaning to the traditional Left/Right political axis. The two traditional extreme ends - Communism and Fascism, have in practice, had a lot in common. Both have for example, been authoritarian. This has lead many political thinkers to ask what exactly Left and Right wings actually represent. In the case of the above compass, Left usually signifies a support for common or public economic ownership, and Right signifies a support for the Free Market of private enterprise. For much of my Life, growing up and living in the West, I like many, was under the impression that Liberalism and democracy, came hand in hand with a Capitalism, while Authoritarianism came hand in hand with State Communism. I believe that a lot of people still think this way. But it simply is not true. Look around at how the World has changed since the collapse of State Communism. The successful models are a hybrid of varying degrees of authoritarian state, that control and permit free markets. Singapore, China, dare I suggest the Russian Federation? Even here in the West - look how our post 9/11 states try to increase their authority ("we have to because of the threat of terrorism"), whilst moving their economies further to free market principles, and away from social democracy. 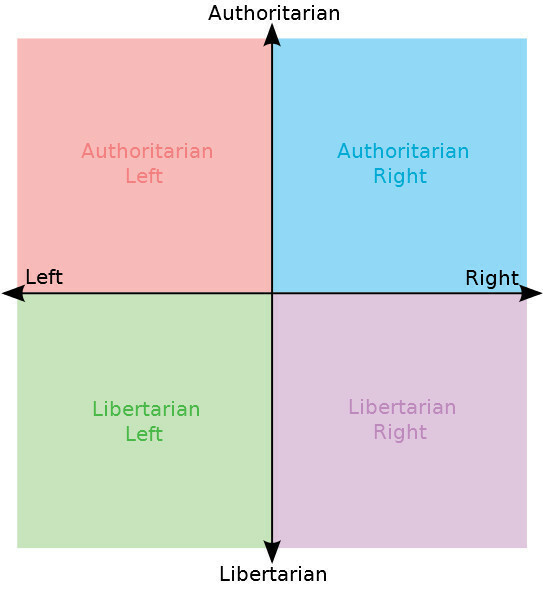 So we need to forget the old single-axis Left/Right model, and instead, we need to plot our stances using a multi-axis political compass. Mine fits somewhere in the Libertarian Left quarter. Exactly where, I couldn't say. Apparently I share this section with the likes of Ghandi. The future appears to be Authoritarian, and Capitalist. A world where everyone is free to work (or suffer unemployment), pay taxes, and above all, consume. They are free the consume the latest upgrade, the latest solid state technology, the latest cars, smart phones, Internet TV subscriptions, and they may even be free to travel. For the majority, perhaps this new social contract is fine. As near to Utopia as we can get. However, a minority of people might not only be freethinkers, but would like to engage in democracy. They might publish criticisms of governments and politicians. They might join free trade unions, protest, perhaps even take part in direct actions. For these people, the minority perhaps, the future is grim. It is a dystopia. They will be spied on, harassed at work, their internet activities and phone traffic scrutinised, they may even be imprisoned, or worse. This is the model that appears to be working across the global economy. A world where you are free to buy an Xbox One or an Iphone #, but you must behave, and you must not oppose. We of course have plenty to keep us on the right track. Perpetual wars in distant lands. The increasing threat of terrorism. The Big Game plays out, in so many ways similar to the perpetual wars of George Orwell's warning, Nineteen Eighty Four. No money for welfare, but money to pour into bombs to be dropped onto far away lands. Dropping bombs to stop terrorism. That really works. I'm pretty sure that if Iran, the West, the Syrians themselves, Turkey, and Russia, really wanted to resolve the civil war there, and destroy ISIS, they could. All that they needed to do was to talk together and to make concessions. Instead, Oceania, East Asia, and Eurasia, will continue with their Big Game. I think that Eurasia are the next to play the bad guy. I remember the Soviet convoys moving into Afghanistan. I remember the support given to Islamic fundamentalist militias by the West - weaponry, intelligence, and big cash. The Afghan warlords were freedom fighters. Ten years of death. Then years later, we have always been at war with Eastasia. The Afghan and Arab Jihadists are the threat to each and everyone of us. We were never at war with Eurasia. Excuse me. Unless you have never read Orwell's 1984, you will not understand my ranting. The lies that they tell us during these wars. Should I mention that charade when the Americans arrived in Baghdad? The carefully orchestrated covering of the fallen statue of Saddam Hussein, with the flag from the Twin Towers? As though that particular despot had anything to do with 9/11! A despot that had been supported by the West during his own long hideous war with Shia Iran. I guess that if you tell enough lies, they become a truth. Orwell understood that very well. After all, he had served in the British wartime propaganda machine. The future is grim.